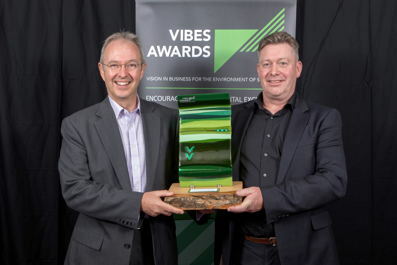 VIBES is Scotland’s leading environmental awards scheme, which for the last 17 years recognises and rewards businesses contributing to the country’s sustainable development by taking significant steps to improve or reduce their impact on the environment. The Award recognises the significant contribution to the environment which Veracity’s products make whilst delivering cutting-edge technology and consistently reliable quality. The manner in which the company and its staff demonstrably commit to reducing energy costs in the production, performance and lifecycle of its products was recognised by the judges. This award, with the continued enthusiasm by the team, should assist in stimulating a wider adoption of this technology globally creating measureable environmental and economic benefits through a quantifiable reduction in the carbon footprint associated with the rapidly growing surveillance industry. Both COLDSTORE and TIMENET were mentioned specifically for the significant levels of energy saved, as was the company’s consideration of the whole end-to-end product lifecycle. Alongside winning the “Environmental Product or Service Award”, Veracity was also shortlisted in the VIBES Innovation category and will now go forward to larger European Awards which take place in 2017. VIBES is a strategic partnership between the Scottish Environment Protection Agency, Scottish Government, Scottish Water, Scottish Enterprise, Highland and Islands Enterprise, Zero Waste Scotland, Energy Saving Trust and Scotland’s 2020 Climate Group. The Awards are further supported by CBI Scotland, the Institute of Directors, the Federation of Small Businesses, Bright Green Business and Quality Scotland.